Greek poetic composition attributed to Manasseh, son of Hezekiah, King of Judah, "when he was holden captive in Babylon" (II Chron. xxxiii. 11-13, 18-19). It is found among the Canticles which, in some of the Septuagint manuscripts, are appended to the Book of Psalms, and is placed at the end of II Chronicles in some Latin manuscripts (see Swete, "The Old Testament in Greek," ii., pp. viii. and xi., and iii., pp. vi. and 802-804; Sabatier, "Bibl. Lat." iii. 1038). It is found also in the "Apostolic Constitutions" (ii. 22) and in the "Didascalia" (where it follows a reference to II Chron. xxxiii.). The Latin translation found in some Vulgate manuscripts is not by Jerome, but is, according to Fritzsche, "certainly of more recent origin." The Prayer of Manasseh was never distinctly recognized as canonical by the Church; but it has been deservedly retained by Luther, and is included in the authorized English version, among the Apocrypha. In the "Apostolic Constitutions" (ii. 22) the whole story of Manasseh is given as an instructive lesson to bishops in their dealings with the erring and in the administration of justice. The story is based upon II Kings xxi. and II Chron. xxxiii. After recounting the sins of Manasseh it relates that he was taken captive to Babylon, bound in shackles of iron, and cast into prison. Bread made of bran and water mixed with vinegar was given him in small quantities, only so much as would keep him alive. In his great affliction he repented of his sins, humbled himself, and sought Yhwh's forgiveness. Then follows the prayer, after which Yhwh had compassion upon him. A flame of fire appeared about him, his chains and shackles melted, and he was restored to Jerusalem and to his kingdom. Thereafter he worshiped Yhwh only and sought to undo the evil he had done in the earlier part of his reign. Julius Africanus (c. 221 C.E. ), apparently, had read the story in this form, for he says that "while Manasseh was reciting a hymn his bonds burst asunder, iron though they were, and he escaped" (see Hastings, "Dict. Bible"). The prayer opens with an invocation addressed to the "Lord, Almighty, God of our fathers, Abraham, Isaac, and Jacob, and of their righteous seed." His power, glory, and majesty are described, and His compassion, long-suffering, and grace to the repentant sinner. The passage following (not found in the Greek MSS. of the LXX.) declares that God has promised forgiveness to the transgressor and has "appointed repentance unto sinners, that they may be saved." He has not appointed repentance only to persons such as the Patriarchs, who have not sinned, but "unto me that am a sinner." There follows a confession of sin, couched for the most part in general terms. The only approach to specific statement is in the words, "I did not Thy will, neither kept I Thy commandments" (omitted by Codex A, "Apostolic Constitutions," and by Latin MSS. ); "I have set up abominations and multiplied offenses." This, of course, may be understood as referring to his idolatrous practises. Next he pleads for forgiveness, and concludes with a confident expectation that God will save him and with an outburst of praise for His mercy. Ewald and, more recently, Budde (Stade's "Zeitschrift," 1892, pp. 39 et seq.) have maintained the view that the Greek version of the prayer is a translationfrom a Hebrew original. This is not impossible, but it is not supported by sufficient evidence. The author was evidently a Jew, but the place and date of composition can not be definitely ascertained. The story in II Chronicles assumes the existence of a Prayer of Manasseh and of various details of his life in the "history of Hozai" (R. V.) or "of the seers" (LXX., ἐπί τῶν λόγων τῶν ὁρώντων). This history must have been lost, and the Greek prayer is, most probably, the attempt of some pious Jew of later times to reproduce it. Schürer ("Hist. of the Jewish People," division ii., vol. 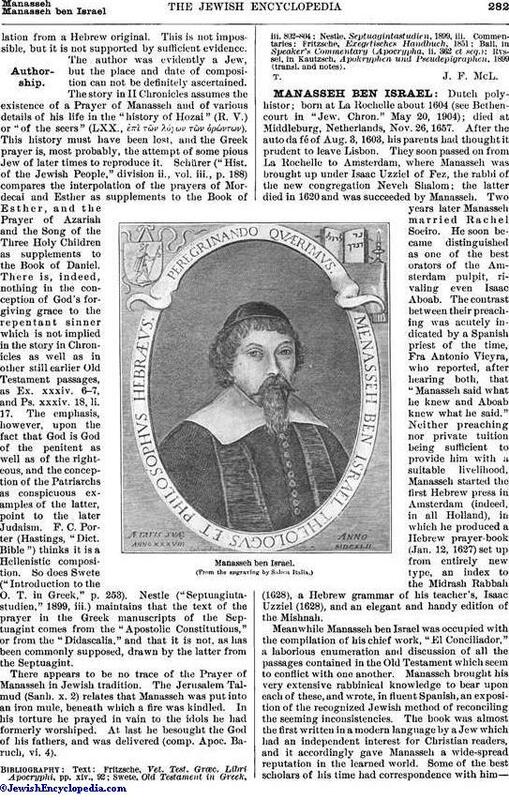 iii., p. 188) compares the interpolation of the prayers of Mordecai and Esther as supplements to the Book of Esther, and the Prayer of Azariah and the Song of the Three Holy Children as supplements to the Book of Daniel. There is, indeed, nothing in the conception of God's forgiving grace to the repentant sinner which is not implied in the story in Chronicles as well as in other still earlier Old Testament passages, as Ex. xxxiv. 6-7, and Ps. xxxiv. 18, li. 17. The emphasis, however, upon the fact that God is God of the penitent as well as of the righteous, and the conception of the Patriarchs as conspicuous examples of the latter, point to the later Judaism. F. C. Porter (Hastings, "Dict. Bible") thinks it is a Hellenistic composition. So does Swete ("Introduction to the O. T. in Greek," p. 253). Nestle ("Septuagintastudien," 1899, iii.) maintains that the text of the prayer in the Greek manuscripts of the Septuagint comes from the "Apostolic Constitutions," or from the "Didascalia," and that it is not, as has been commonly supposed, drawn by the latter from the Septuagint. There appears to be no trace of the Prayer of Manasseh in Jewish tradition. 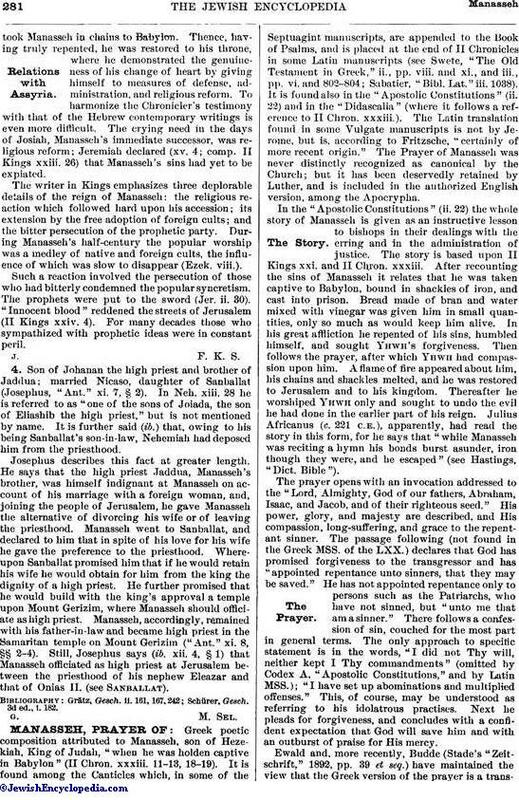 The Jerusalem Talmud (Sanh. x. 2) relates that Manasseh was put into an iron mule, beneath which a fire was kindled. In his torture he prayed in vain to the idols he had formerly worshiped. At last he besought the God of his fathers, and was delivered (comp. Apoc. Baruch, vi. 4). Ryssel, in Kautzsch, Apokryphen und Pseudepigraphen, 1899 (transl. and notes).